Wormwood’s woody rootstock produces many bushy stems, which grow from 2-4 feet high and bear alternate, bi- or tri-pinnate leaves with long, obtuse lobes. Numerous tiny, yellow-green, rayless flower heads grow in leafy panicles from July to October. There are other varieties of wormwood. 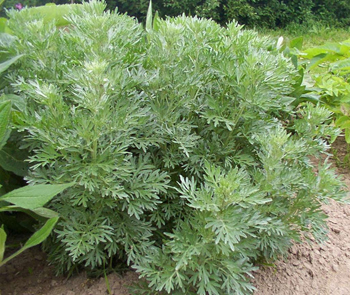 Annual wormwood (Artemisia annua L.) otherwise known as Sweet Annie, is a bushy plant 1-9 feet tall; used in the treatment of malaria. Related to A. absinthium, it is not poisonous but may cause dermatitis. A. heterophylla; Paiute name is “Kose-wiup,” At Owyhee, Nevada, a basket was used to steep these wormwood leaves, and put them next to a baby’s skin to reduce fever. The Shoshone name for this herb is “Pava hobe,” California Native Americans called it “Poonkinny.” Packets of steamed plants were placed on limbs for rheumatism, and a sweat bath given. Another wormwood, (A. gnaphalodes), Paiute and Shoshone gave the same names as to A. heterophylla. They made a tea called “Ba wa zip,” (young people’s tea). Smoky Valley Tea and steam bath was for young girls approaching maturity. Wormwood’s name is obviously derived from its medicinal property of expelling intestinal worms for which it has been well known since ancient times. An Egyptian papyrus dated 1,600 years before Christ describes this bitter herb. Legend has it that this plant first sprang up on the impressions marking the serpent’s tail as he slithered his way out of Eden. According to folk beliefs, wormwood was reputed to deprive a man of his courage, but a salve made from it was supposed to be effective in driving away goblins who came at night. It got its generic name from Artemis, the Greek name for Diana, because she discovered the plant’s virtues and gave them to mankind. Another story has it that it is named for Artemisia, Queen of Caria, who gave her name to the plant after she had benefited from its treatments. Wherever its name came from, it is one of the bitterest herbs known. Its common name comes from its ability to act as a wormer in children and animals. It was used in granaries to drive away weevils and insects, and was used as a strewing herb in spring to drive fleas away.